Recent indications suggest that the differences over Ottavio Quattrocchi have assumed the dimensions of a rift at the very top, playing havoc with governance. 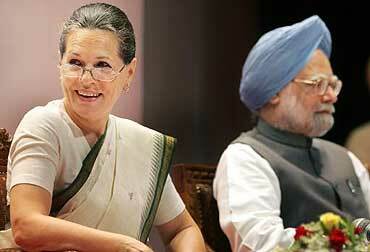 Speculation about differences between Prime Minister Manmohan Singh and Mrs Sonia Gandhi has often surfaced in the past. Opposition by the Left Front to the policies of Dr Singh, Mr P Chidambaram and Mr Montek Singh Ahluwalia has generally been cited as the cause of tension. The Left did entertain serious reservations about policies of this trio. But Mrs Gandhi successfully smoothed ruffled feathers of the Left without seriously compromising the government. Now, however, an emotive issue has arisen to divide the UPA government at the very top. The issue is Ottavio Quattrocchi. Readers might recall what this scribe wrote immediately after news of Quattrocchi's arrest broke on the night of February 23rd. On February 25th I wrote: "There seemed to be a tug-of-war within the government over how to handle the issue." It turned out that the news of the arrest was leaked only on the day that Quattrocchi was released on bail -- on February 23rd. Subsequent disclosures suggest that the differences have assumed the dimensions of a rift between the PMO and 10 Janpath. This rift surfaced after an incident involving one MV Rao. On February 21st, two days before the news broke of Quattrocchi's arrest, and before he was released on bail, newspapers reported that a fraudulent person posing as an "adviser" to the Prime Minister was contacting people. The Prime Minister's Press Adviser, Mr Sanjaya Baru, told the media: "It has come to the attention of the PMO that one Dr M.V. Rao has circulated visiting cards and greeting cards describing himself as adviser to the Prime Minister. . . . There is no such adviser to the Prime Minister." The PMO asked the agencies concerned to identify the imposter and take necessary action. However, on February 27th Mr Baru told The Indian Express that "no complaint had been filed in this regard with the Delhi Police". But the police did arrest MV Rao from his Green Park house in South Delhi on February 23rd. According to the Express report, "the Delhi Police was directed only to register a case of impersonation at Parliament Street Police Station". In subsequent raids at Rao's house and office the police recovered Rs 1.92 crore, which was handed over to the I-T Department. However, on the very next day, February 28th, PTI reported that MV Rao had been arrested on the basis of a complaint filed by the PMO. The PTI report therefore set the record straight. Despite Mr Baru's disclaimer of February 27th, the PMO had in fact filed a complaint against Rao. So what happened between February 21st and February 27th to persuade the PMO to downplay the MV Rao episode? It is reasonable to infer that some pressure had been exerted. Who could exert pressure to override even the PMO? Only one guess is required. MV Rao, 75 years old, has been described as an educated man who speaks fluent English. He is not exactly small fry. He is linked to the Dynasty. He was active in the 1980s as an arms dealer during the HDW submarine deal. That notorious deal, still under investigation, was made when Mr SS Siddhu, personally close to the late Rajiv Gandhi, worked in the Defence Ministry. The police investigation named Mr Siddhu in court as a witness required for further questioning to wind up the case. While the investigation was still under way, the UPA government appointed Mr Siddhu as governor of Manipur, a post which he holds to this day. Governors are not questioned by the police. What the police forgot to tell the media was that during the raid on MV Rao's premises, apart from Rs 1.92 crore, the police also seized a migration slip and other papers. The migration slip was in the name of Massimo Quattrocchi, son of Ottavio Quattrocchi. The police inferred that Rao went to receive Massimo at the airport when he visited India during the days before his father was released in Argentina. Among the papers seized by the police there was also a letter written in Italian. Without a copy of the letter in hand, it would be presumptuous to report on its broad contents. It may be noted however that the coincidence of the government releasing news about Quattrocchi's arrest on the very day he was released on bail in Argentina seems unusual. The government was informed of Quattrocchi's arrest on February 7th. It delayed disclosure till February 23rd. Any attempt to prevent his bail therefore was ruled out. Last heard Rao was in Ashlok Hospital in South Delhi. Is he still there? Is he under detention or a free man? What is the status of the PMO complaint against him? If detained, under what charge is he held? If free, did the PMO level a false charge against him? If India had a genuine opposition, answers to these could be demanded. Do mixed signals from the PMO point to any tension between 10 Janpath and 7 Race Course Road? Subsequent events indicate they just might. There was the episode, for instance, of the peasant leader, Mahindra Singh Tikait. Mrs Sonia Gandhi suggested a tie up between Congress and Tikait for the UP polls. Mr Rahul Gandhi and Captain Satish Sharma met Tikait and invited him to Delhi, to meet with the PM. Tikait landed up with 25,000 followers. But the PM had no time to meet him. Recently, last Saturday, the PM sang paeans of praise to the late Narasimha Rao whom Rahul Gandhi had indirectly criticized. On a more critical aspect: this rift at the top is playing havoc with the nation's governance. The crisis in the J&K coalition government is a pointer. The Congress coalition partner, Mufti Mohammed Sayeed, demanded an immediate troop withdrawal from the valley. The central government is committed to this goal, but it was calibrating withdrawal in the light of peace talks with Pakistan. The merits or otherwise of Mufti's demand apart, the decision involves national security and foreign policy, which are the central government's sole prerogative. The PM demurred. Mufti approached Mrs Sonia Gandhi. The PM had to relent. He appointed a committee to recommend steps for troop withdrawal. A dangerous precedent has been created. Already, coalition partner Karunanidhi of the DMK has threatened unilateral action against Sri Lanka if the central government does not warn Colombo over the death of Indian fishermen. Next, will the West Bengal government determine policy for dealing with Bangladesh? Will Northeast governments dictate India's policy towards Myanmar... ? Governance at the centre is collapsing. That threatens not just the government. It threatens the Indian Republic.